The final Senior match at Warrington on August 5th was characterised by some excellent efforts from our women led by wins from June Swift (800m 2.15.7), the indefatigable Kirsty Longley(3000m 10.59.1), the talented Faye Akins (High Jump 1.55= and TJ 9.75) and Philippa Makepeace (Long Jump 4.94). The real icing on the cake was a 4 x 100m relay win in 52.2. Sole A victor among the men was Mark Grimshaw(400m in 49.5) but there was sufficient quality doubling-up acts collecting high placing to ensure the club ran out third on the day and second overall. Again the club looks comfortable at this level and promotion is not being pursued. Harry Doran, our Northern Under 17 400m champion, was one of the favourites for this title at Don Valley on the weekend of August 10th and 11th. Sadly a foot injury has put him out for the season but immediately Nathan Hilton stepped up to the crease with a remarkable series of runs… a heat time of 50.81, a semi of 49.96 and a brilliant 49.54 bronze medal placing in the final behind Nathan Wake of Herts who ran the best time this year of 48.77. An earlier report paid homage to five athletes in the club who have run under 50 seconds for one lap, now we add a sixth in the shape of Nathan. Astonishingly Danny Higham’s semi-final time of 50.77 was not good enough for the final but indicates a seventh possibility! Coaches Ray Twentyman and Tricia Farrell have every reason to be delighted with this season. 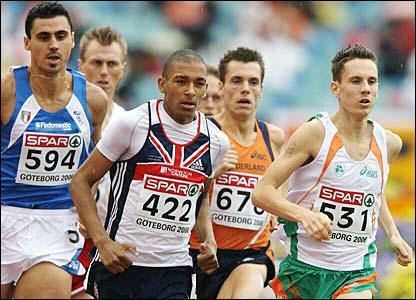 Michael Rimmer competed on athletics biggest stage, the World Championships in Osaka, Japan. He has had a fantastic season confirming his position as Britain’s No 1 800m runner and went to the Games having already met and defeated some of the principal contenders for the final. In his heat he looked very formidable indeed finishing a comfortable second in 1.45.66 and exciting comments from commentators for his maturity and class. He had already proved a master tactician on the European circuit but things went awry in the semi-final as he found himself forced into the lead. With class runners around this was not the best position to be in and his courageous front running was bound to be capitalised on by the rest of the field. Although he entered the finishing straight in front he was swept aside in the rush for the line and faded to 6th in a disappointing 1.47.39. After the race he joked that maybe that was Plan D. He went on to say: `To be honest, from the break I was running scared as I’m not a front runner. I was waiting for them to come. At 80 metres to go you should focus on form, but I was waiting for them and I crumbled’. At 21 Rimmer is still learning and he went on to comment: `It was important for my development to make the final but just being here is a massive eye-opener. I will be back stronger next year’. Next year, of course, is the Olympic Games in Beijing. However, there is no getting away from the disappointment of the occasion particularly as the final of the 800m turned out to be exactly the sort of tactical race Michael would have revelled in. The plus side for Michael is the invaluable experience he has gained this season at the very top level of two lap running. He now knows there is nobody in the world he need fear. Together with coach, Norman Poole, he will go back to the tough winter training regime and meticulous planning that has transformed him into Britain’s best 800m prospect in a generation.